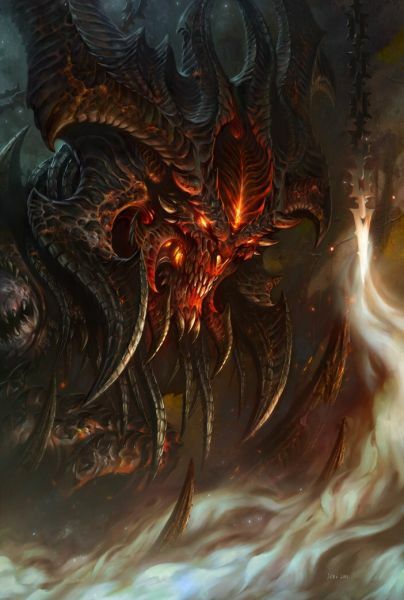 [wiki]Diablo[/wiki] artwork by [wiki]Wang Wei[/wiki], AKA Glowei. This image was featured on the [wiki]BlizzCon 2010[/wiki] official logo, as well as the King of Hearts in the [wiki]Diablo poker set[/wiki]. Thanks! Not like I had anything to do with it other than uploading it.... but thanks! Diablo really has got lots of huge horns and spikes this time around. D3 Fan Creations Forum Moderator I really do like this version of him though. more detailed.